One year subscription, includes all updates. 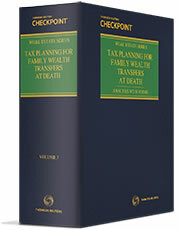 Tax Planning for Family Wealth Transfers At Death: Analysis with Forms by Howard M. Zaritsky provides detailed discussion and analysis of the special income, estate and generation-skipping transfer tax issues and strategies concerning the transmission of an individual’s or family’s assets at death. While planning for lifetime transfers is not always needed, planning for transfers at death — especially for those with sufficient assets and tax exposure — is always a necessity. That’s why this new treatise is an essential addition to any estate planner’s library. Tax Planning for Family Wealth Transfers At Death addresses how well-planned transfers at death can preserve a family’s wealth by minimizing taxes and other costs. Containing over 500 sample wills, trusts and client explanation letters for use in your estate planning practice, this treatise is the companion publication to Howard Zaritsky’s Tax Planning for Family Wealth Transfers During Life: Analysis With Forms, which discusses the various ways that lifetime transfers can reduce a family’s income, estate, gift and generation-skipping transfer taxes.